Born on January 15, 1965 in Dunedin, Florida, Michael Clemons is the current head coach of the Toronto (Ontario) Argonauts of the Canadian Football League (CFL). Clemons began his career in the CFL in 1989 as a player for the Toronto Argonauts and remained with them until his retirement in September of 2000, when he moved directly into the position of head coach. Clemons attended the College of William and Mary in Williamsburg, Virginia where he played running back and return specialist on the football team as well as soccer for a year. At only 5’6” and 170 pounds Clemons overcame obstacles and persevered through an impressive four-year college football career in which he compiled 4,778 all purpose yards and was named a Division 1-AA All American. When Clemons first joined the Toronto Argonauts in 1989, head coach Bob O”Bilovich nicknamed him “Pinball” because of his running style. His diminutive size and extraordinary balance allowed him to bounce between defensive players much like a pinball inside a pinball machine. As a player, Clemons compiled a brilliant CFL career with the Toronto Argonauts, including a pro-football record for most career combined yards with 25,396. Clemons #31jersey is one of only four that has been retired by the Argonauts. He is one of the Toronto Argonauts most famous former players and one of the most popular professional athletes in the history of Toronto. Renowned as one of pro football’s most electrifying players, it is his exceptional character, in addition to his outstanding athletic ability, which has made him the remarkable fan favourite he is throughout Canada. In 2004 Clemons led his team to its first Grey Cup victory since 1997, and his first as head coach. Clemons is a devout Christian and a frequent public speaker on community and Christianity. Some of his most impressive work may be off the field. He works tirelessly with organizations like Athletes in Action and Power to Change. On August 21, 2007 Clemons founded the “Michael ‘Pinball’ Clemons Foundation” which is dedicated to helping disadvantaged youth. Through his commitment to community initiatives, Clemons is widely regarded as a role model for the African Canadian community in Toronto. 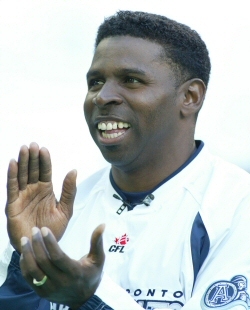 Michael “Pinball” Clemons currently resides in Oakville, Ontario with his wife and three daughters, as a permanent resident of Canada. CFL.ca Network: Official site of the Canadian Football League; Michael Pinball Clemons, All Heart: My Story (New York: HarperCollins Publishers, 1999) Perry Lefko, The Making of a Canadian Hero ( New York: Wiley Publishers, 2006) Canadian Football League facts, figures and records (Toronto: Canadian Football League, 2006). and records (Toronto: Canadian Football League, 2006).